John Barlow writes about getting Skype calls from chinese girls to practice english. This is once again one of those things where the internet changes everything, with telephones this would have been completely out of the question. People that are willing to exchange practice, for example an English speaker that wants to learn French could hook up with a french speaker wanting the reverse. People that are willing to pay for private lessons and amateur or professional teachers. People that are want to pay for private lessons and teachers amateur or profesional. I still think Skype needs to be very careful about phone bots and spam creeping into the system. "Look, we all know there will be flaws in this election but let's give it a go. It's not going to be perfect... but do you have a better solution?" There are many kinds of art but I have not seen good political art in a long time until this "Licence to Sit". 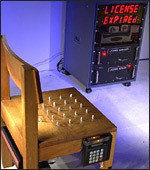 Here is the Internet Chair with magnetic stripe card reader and spikes that retract when a seating license is downloaded from a license server in response to input from the card reader incoroprated into the chair. If you are following the insipid growth of service locked devices and digital rights management this piece is much scarier than funny. I recently saw the first Ghost in the Shell and was blown away by all the things that it had pioneered, a lot of the visual style in Matrix was directly ripped from it. So I had high expectations walking in to see this iteration. Instead of innovating new visual styles I feel this one is more a series of homages to other movies like Bladerunner. I also feel the coexistence between the computer animated and hand animated is strained at time. The story is ultimately more understandable even a little thin. Worth seeing for its stunning images but ultimately disappointing. Not only did Jon Stewart scores big with the internet crowd when he attacked CNN's Crossfire live on their own show but CNN boss, Jonathan Klein has also hear him and axed the show. "CNN is a different animal," Mr. Klein said. "We report the news. Fox talks about the news. They're very good at what they do and we're very good at what we do." Just one question, If CNN reports the news and Fox Comments on the news who analyses the news?